Here are a couple of quick knits. 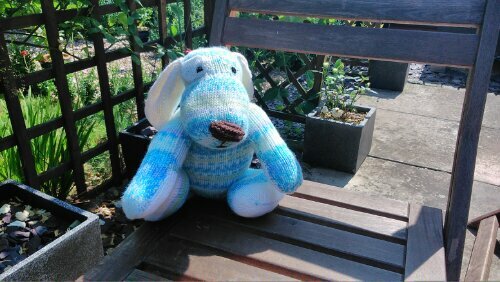 First up we have Sirdar 1458, a rather lovely and cuddly dog I have called Wonky because I must have sewn his nose on when asleep. He is knit in Sirdar Snuggly DK and Baby Crofter DK, both of which are so incredibly soft, perfect for cuddles! I’m pretty pleased with Wonky although I do wish that with toy patterns they would have clearer images of where and how to attach the limbs. Still, I see a few of these dogs in my knitting future as gifts for little people. 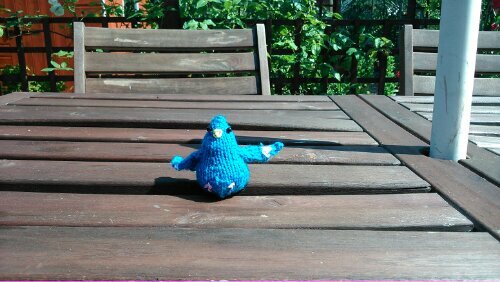 Next up we have Cooey the pigeon from Stitch London by Lauren O’Farrell. This book was a birthday present and came with the supplies for making Cooey (except the stuffing). Cooey is actually much smaller than I was expecting, but very cute. The only change I made was to embroider the feet as I decided to keep the pipe cleaners for my next Cooey which I plan to make bigger. Really cute soft toys. I’m inspired. My nephew is going to be a father soon.